TCIA's mission as a trade association is to advance tree care businesses. One of the primary ways to protect and advance the industry is by influencing public policy in a direction favorable for our members. We do this with contributions to political campaigns through the Voice for Trees Political Action Committee (VFT-PAC), by weighing in on select legislative/regulatory issues, and by directly involving members in grassroots efforts. Click on a tab below to learn more. $295.00 per person. TCIA members only. Registration includes all briefings and appointments, Tuesday’s dinner and Wednesday’s breakfast and lunch. Deadline to register is May 31, 2019. TCIA reserves the right to modify the agenda as needed. Reservations are separate from event registration and must be made by May 28, 2019. Through grassroots efforts in the states and through direct action by TCIA’s lobbyists, staff and members, your industry’s trade association works to promote the interests of commercial and utility arboriculture. Our lobbying efforts aim to ensure that policymakers understand the complexities involved in running a safe, professional tree care company. Our goal is to limit burdensome laws and regulations while promoting programs that help tree care companies succeed. The Day on the Hill involves briefings on the issues of importance for your business, followed by a day of meetings with Senators, Representatives and their staffs. We may also have meetings with executive branch officials. TCIA will make your appointments for you and you will be part of a larger delegation visiting offices. You may, of course, head out on your own to see your elected officials if you choose. Topics could include OSHA, labor policy, immigration issues, regulations and forestry policy. TCIA, through its membership, is organized as a trade association. What does that mean specifically, and how is TCIA different from other groups in the green industry? A trade association is an organization founded and funded by businesses. TCIA's mission is to "advance tree care businesses." One of the primary ways to protect and advance the industry is through attempts to influence public policy in a direction favorable to our members. TCIA does this with contributions to the campaigns of political candidates through the Voice for Trees political action committee, by supporting or opposing particular legislation, and by working to influence the activities of regulatory bodies such as OSHA and EPA. There are almost 8,000 national trade associations in the United States, but only one represents the interests of the tree care industry. 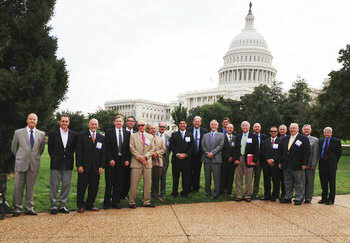 No one knows tree care better than the people who run businesses every day, and TCIA – through its dedicated members – will continue to educate Washington on the unique issues and challenges the industry faces. Please contact TCIA President David White at dwhite@tcia.org or by calling (603) 314-5380 if you would like learn more about how you can take a more active role in your industry's government relations efforts.